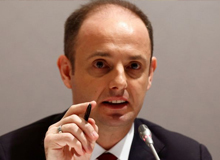 The Turkish Central Bank aims to simplify its monetary policy as much as economic conditions will allow, the bank’s new Governor, Murat Cetinkaya, said on Tuesday. ddressing a press conference to announce Turkey’s second inflation report, Cetinkaya said, "We took steps of simplification in monetary policy and will continue to do so as much as circumstances will allow." However, he said these steps are closely linked to global economic conditions and local macro indicators. On April 20, soon after Cetinkaya took the helm, the bank’s monetary policy committee introduced a 50 basis-point rate cut to the overnight lending rate, or the upper limit of the interest rate corridor policy. The bank in the same meeting also left the one-week repo rate unchanged at 7.5 percent and the overnight borrowing rate unchanged at 7.25 percent. Despite the cut, Cetinkaya stressed at the press conference that further cuts would be dependent on the inflation outlook. "Monetary policy in the forthcoming period will be closely linked to the inflation outlook. Taking inflation expectations, pricing behavior and other developments into account, we will maintain a tight monetary policy as long as required," he said. The bank left the year-end inflation forecast for 2016 and 2017 unchanged at 7.5 percent and 6 percent respectively. Cetinkaya said that the reduction of uncertainties in Turkey from a year before is likely to boost local consumption through bringing about improvements in consumer and investor confidence. He also added, "A decline in global volatility positively affects local financial conditions. In 2016, we expect local consumption to grow to an extent comparable to 2015." On April 11, Cetinkaya was appointed as the new governor of Turkey's Central Bank to replace Erdem Basci, who often had differences of opinion with government officials over monetary policy as the Turkish government favoured lower rates to boost investment.